It seems like spring when I find veal and lamb shanks at the grocery store. It is not as usual to find veal so most often we celebrate spring with a lamb shank. 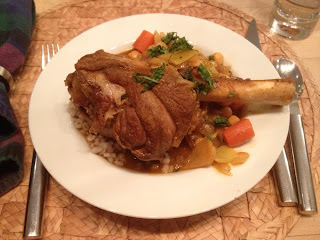 In fact, the recipe I found on line called for veal shank and I substituted lamb shank instead. I picked the recipe- Moroccan Braised Veal Shanks- because of all the wonderful spices included and I also had butternut squash I wanted to use up already in my kitchen. This recipe takes about an hour and a half to cook so it is one I would plan for a weekend meal. It is a little higher in calories as well with 455 calories per serving so it is one I save for weekend special meals. It certainly qualifies for a meal to serve your friends. My family is not a big friend of couscous. We find it a little dry. When I found out it was a form of pasta and not a grain, it made it easy to go ahead and substitute. In this recipe I used barley instead of couscous. It takes about the same amount of time to cook as the shank so you want to start cooking the barley when you begin preparing your dinner. To complete the meal I served a Romaine salad with my homemade lemon vinaigrette with oregano (40/cal) for a total calorie count of 495. This meal was a big hit. Not a morsel was left on the bone or in the bowl. A definite repeat.